If you’re looking for affordable jewerly, Plastique has unique rings, necklaces and earrings in the $10-25 price range. Best of all, their black acrylic style go with any bold music lover’s outfits, particularly if they have a penchant for turntables, cassettes and architecture. 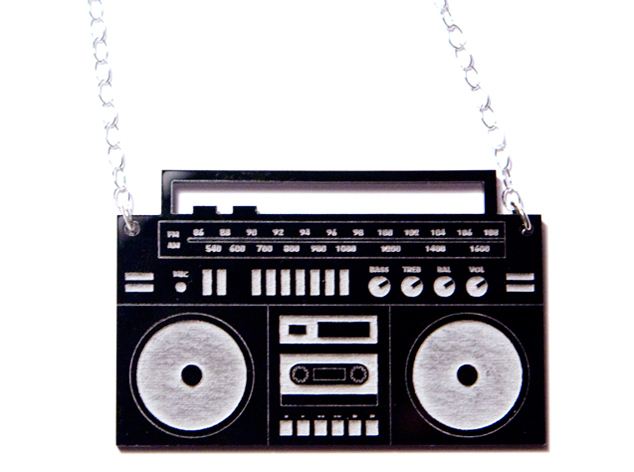 Nothing says “Merry Christmas” like a boombox necklace. Keith Richards’ Life and Jay-Z’s Decoded are the big books that came out this year, but almost any significant rock star has got his or her own book. (I don’t think anyone’s written one about Jimmy Ray yet, though…) Most of their stories are interesting (I liked Anthony Kiedis’ Scar Tissue, for example) but try and find an artist that your recipient really likes. If you want a fiction book, I strongly recommend Nick Hornby’s latest book, Juliet Naked. Want to make sure breakfast rocks? 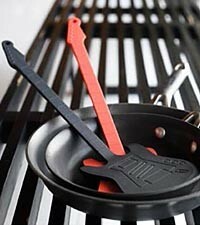 Get a spatula in the shape of guitar. It’s plastic, it’s cheap ($12) and it gets the job done. Daft Punk did the soundtrack for the Tron: Legacy film and, although the movie hasn’t come out yet, I can picture most of the scenes based on the music score (and knowing what I know about the original Disney film Tron). That being said, the soundtrack sounds very little like Daft Punk (except the track “Derezzed”) but the robot DJ duo connection with a futuristic film is certainly a fun one. So if you know a music geek who likes toys, they’ll love the Daft Punk action figures (starting at $4.99). If your budget’s a bit bigger, and you know they’ve been craving Dr. Dre’s Beats headphones, then you might want to gift the Tron headphones ($399) from the same company. If you don’t know your best friend’s favorite artists, then what kind of friend are you? Next time you’re at their place, snoop around and see if they have any box sets lying around. If not, and you’re willing to spend $50-100 you could get a really awesome package. Tom Petty, The Rolling Stones, Bruce Springsteen, whoever – any artist that’s actually built a career (of more than three albums) on music, songwriting and talent has a box set somewhere. Some can get outrageously pricey, though, like The Genius of Miles Davis Box Set, priced at $749. It’s annoying when your drummer friend has to rap his fingers on every imaginable surface, isn’t it? 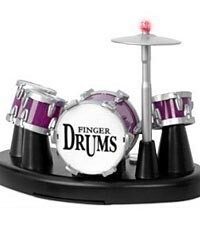 But you’ll never stop them, so you might as well just indulge them with an actual finger drum kit ($18.50). 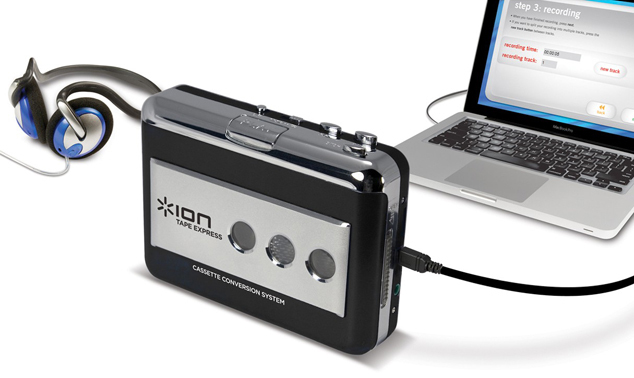 If they have a Playstation 3 or an XBox 360, they’ve got to have one of these. Rock Band 3 comes with a keytar, so you can play the keyboard for songs like “Bohemian Rhapsody” or “Imagine,” while DJ Hero 2 hosts a huge variety of mashups and remixes from big name artists ranging from the Black Eyed Peas to DJ Tiesto. Just ask if they prefer rocking out or c-c-cuttin’ and scratchin’ and you’ll know which video game to buy. I only like about half a dozen KISS songs, but the average member of the KISS Army loves every note they’ve ever played. And while they may resent the Mini-KISS group (or their obnoxious-but-kind-of-cute soda commercials) they’ll probably want these. Aw, shucks. 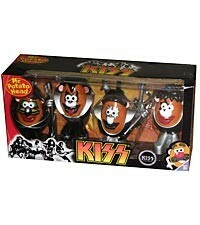 They are kind of cute: KISS Potato Heads, coming to a Toy Story near you for $41.55. The kitchen doesn’t say “I love music” enough, does it? 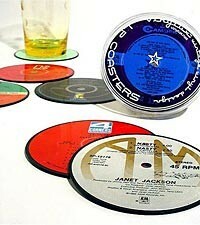 Get them coasters ($17.99) made out of their favorite Run DMC records or a bowl ($26.99) converted from their Bee Gees’ LPs. Put a little of yourself into the gift. 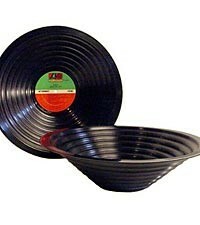 Your friends and family all have music that they know and love, but what about the music you know and love? Do they know about it? Perhaps, perhaps not. Put together a compilation CD of songs you know they like, songs you think they might like, and songs they probably don’t know but should like. Even if they don’t like all the music, chances are they’ll be surprised to find they like new artists or songs you introduced them to, and that’ll set them on a path to discovering more new music they’ll love. Or at least you could have fun conversations about it afterwards. “What’s the worst cover of a Beatles song you’ve ever heard?” “Name your top 5 songs to listen to while on the treadmill.” And so on. So get shopping, kids. I suppose you could get a Michael Jackson belt buckle or Lady Gaga headphones, too, if you really wanted one. This entry was posted in Holidays, Lists, Music and tagged christmas, gift guide, holidays, music by Geoff 'DeafGeoff' Herbert. Bookmark the permalink.